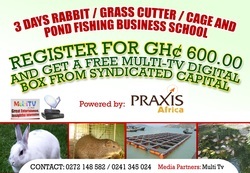 Farm Channel Ghana is an agricultural television program committed to providing the Ghanaian agriculture sector with timely and relevant news, price information and best agricultural practices. The program is aired every Friday on GTV from 4:30 - 5:00pm. Sign up to RECEIVE episodes via email!